Browse : Home Content Marketing Content Marketing Mission Statement – How To Create The Best One? Content Marketing Mission Statement – How To Create The Best One? We have often seen mission statements being written in our homes that depicts the purpose of a family. It is something that is followed by your family members including your kids. It is what we strive to be today and in the future. 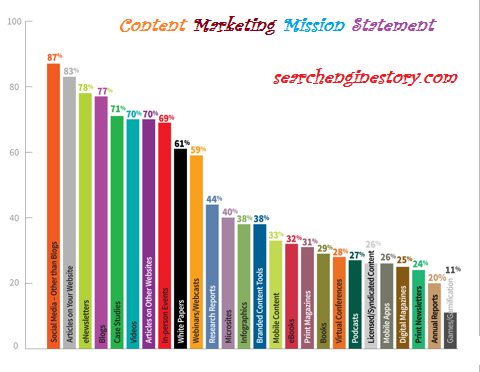 Similarly, content marketers also have a particular content marketing mission. What’s yours? Since the last 20 years, mission statements have already got a bad rap in the business world. Why are you creating a particular content? Is it only to have a concise and clear mission to refer back to? The content marketers are both able to define their brand and also their content goals. The mission-driven content won’t always sell products or services; it educates people and sparks discussion and also creates a positive impact on the audience. While you create a content mission statement, remember that you don’t need it to be idealistic and lofty. Try to start off with the following questions. 1. Who’s going to be my core audience? The first question that you require asking yourself is about your target audience. You need to do a lot of homework and dive deep into a new demographic analysis and use the data and the statistics to paint a clean and vivid picture of your readers and visitors. Who are your visitors? Where do they live? What is their occupation? What are their problems? Why do you think they would engage with your brand of services and products? Determine whether or not your audience is scattered throughout the country or are they residing throughout the globe? These should be the initial thoughts that should come to your mind. 2. What am I going to offer my audience? What are the problems that your current customers are having with your brand? Once you come to know about their problems, you now have to know the ways in which you can create content for them so that it addresses their pain in different interesting ways. Apart from offering great and relevant content, you also have to take into account the fact that the content should be offered in the best possible format. Since the only medium to communicate is message, the choice of the format that you will use will always have a huge impact to make your audience engage with your brand. 3. In what ways can I help my audience? What is the exact kind of impact that you want your content to have on your audience? Do you have the ability of offering challenging content through which they can see things in a different light? Can you share some of the best and the most useful tips with them that could make their life easier? Or is it more vital to craft your content in a more entertaining and funny manner? When you aim to make your audience complete and feel better after going through your article, your aim is a big one and hence you should take steps to achieve that aim. 4. Can I craft my statement and start seeding it? Well, yes, once you have done the required research on all the above mentioned questions, now is the time to craft the content and start seeding it in the right direction. Make sure the content is of high quality, has enough information and doesn’t sound promotional in any way. Promote your content through the social media so that it reaches the right audience. Hence, if you want to abide by the rules of Google and start off with gaining traffic and boosting your visibility, first create the best content marketing mission statement.